I can tell everybody got bored with the hammer efficiency thread. No surprise. It is probably only of interest to people who hand drill a fair number of bolts and there probably isn't very many of us. Based on the results of my tests (summarized in this post: http://www.supertopo.com/climbing/thread.php?topic_id=2435668&msg=2447140#msg2447140) I have made a hammer to see if I can better the McDevitt. It is hard to shake the belief that heavier is better so I made mine a little bit heavier than the McDevitt. 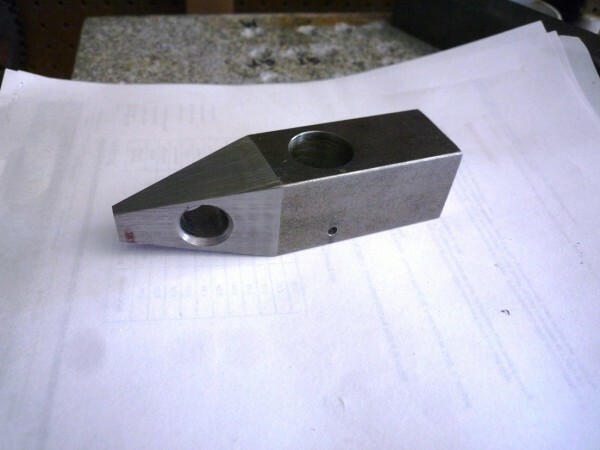 I bought some square 1-1/4" bar stock which was said to be 4140/4142. When you buy small amounts, you don't get much control over specifications but I was told it was supplied Rockwell B90 and can be hardened to C60. I don't have access to a milling machine right now so I simply drilled holes in it with a drill press and cut it to shape in a horizontal bandsaw. It didn't come out pretty but I think it came out just fine. I couldn't make the curved cut on the McDevitt so I made a straight ones and changed the dimensions a bit so the biner hole would work. Without a mill I couldn't make the oval hole for the handle and settled for a round one. 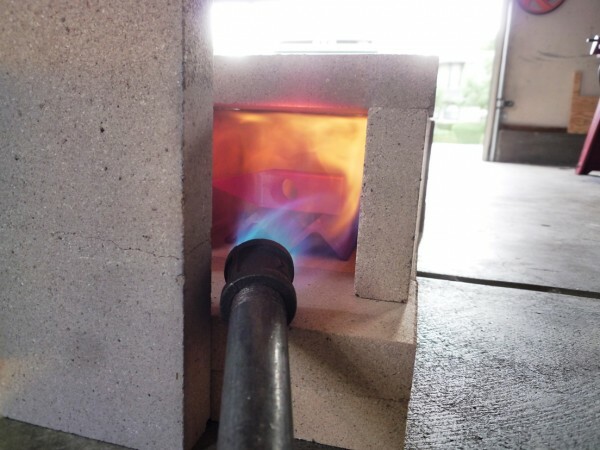 After cutting and drilling, I needed to harden the steel so I set up my big propane torch and heated it to about the right color for 45 minutes. I then quenched it in the oil I had on hand - used motor oil from my car. Not the best oil to use but it seemed to work. quenching oil in an old soup pot. After cooling, it looked pretty good. 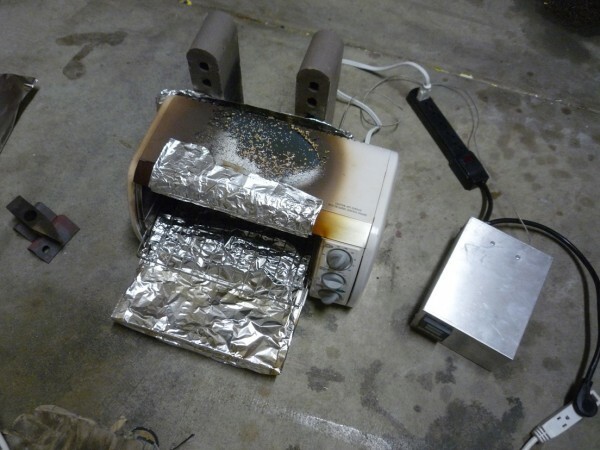 I then needed to temper it at about 600 degrees F. So I stole the toaster oven from the kitchen, hot wired it and ran it through a cheap ($25 on Ebay) PID temperature controller. The little oven had a hard time getting up to temperature since it isn't insulated. 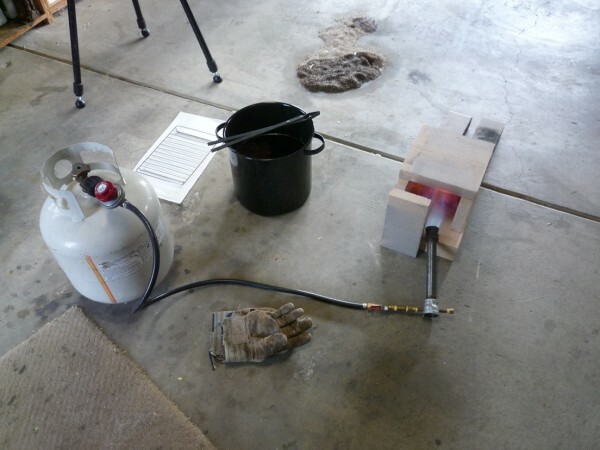 Not having any rock wool, I had to use a lot of aluminum foil to insulate it before it would get to temperature. After 2 hours, much nervous hand wringing and some impressive (and no doubt toxic) smoke as the paint burned off the oven, it was done. 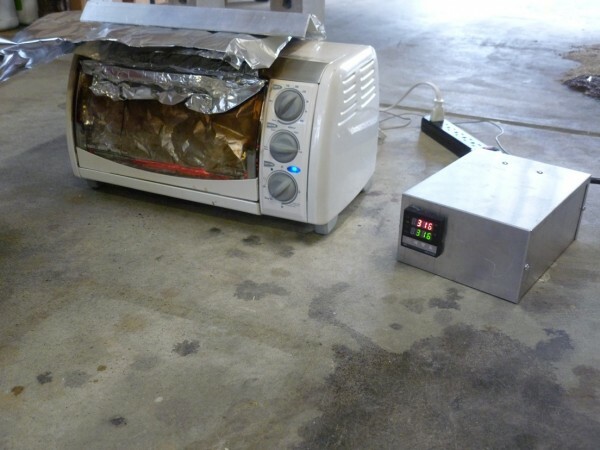 The toaster oven is pretty much done too. I wanted to check hardness but don't have a Rockwell tester so I placed a ball bearing between the side of the McD hammer and the side of my hammer and hit it a good whack with a third hammer. Looking at the diameter of the dent, I think mine is close to the McD hardness but perhaps a tiny bit softer. 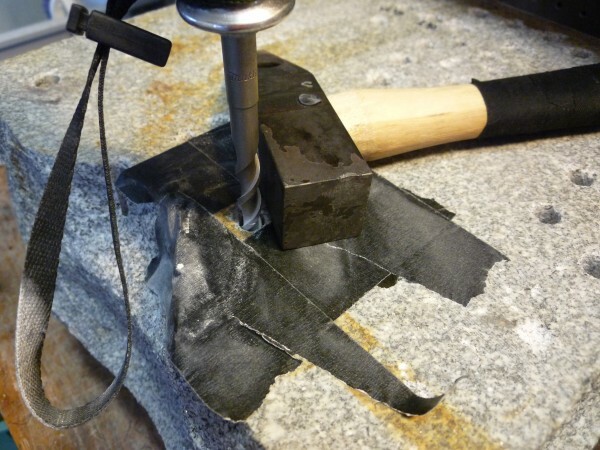 Tempered head with redneck hardness tester. I got a $6 handle from Ace Hardware and turned the end of it down to round on the lathe. 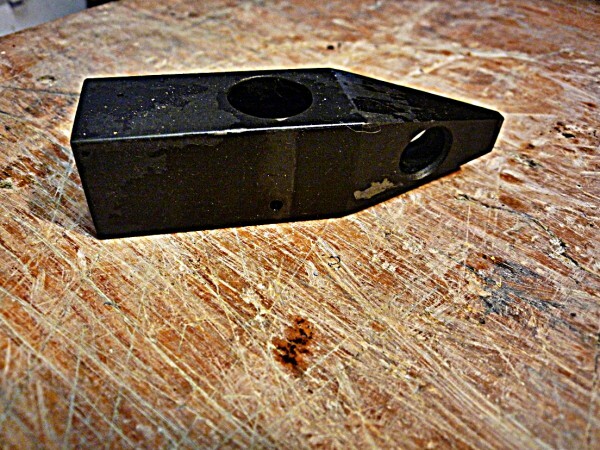 I put the handle in the hole but didn't quite get it square - because of which it is now a right handed hammer. I drove a nail through the head and handle in place of the spring pin in the McD and pounded the ends of the nail like a rivet. Banquo Hammer (top) and McDevitt hammer. Next was to try it out. 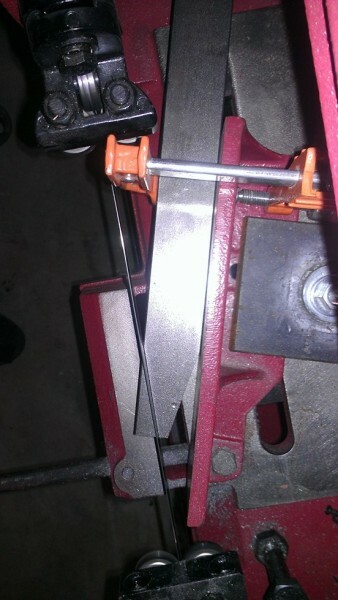 Using a freshly sharpened bit, I spent exactly 5 minutes pounding and managed to go 1.82 inches. The hammer feels good and swings well but I could tell it was heavy and had to pace myself. It drilled pretty fast but not as fast as the Mcdevitt. 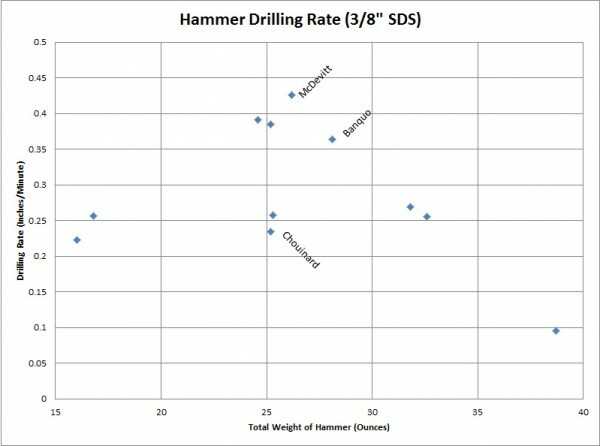 The plot below shows drilling speed for all the hammers I have tested. Results are normalized to new unsharpened bits. The actual results with sharpened bits are faster. I think I discussed this in the earlier thread. 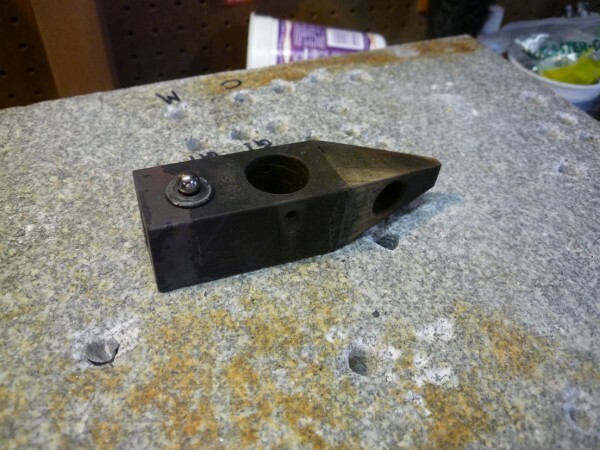 The next and slightly smaller hammer head is being tempered as I type this. Stay tuned for results. This is all fascinating, TFPU! Banquo redneck engineering at it's finest. Nah, she's fine, got a new toaster oven and I'm in the garage and out of her hair. I'm thinking "Banquo Hammer" is too stodgy. Since my name is Dan Merrick, I'm thinking of calling it a DAMMERR. Interesting! What I would still like to see is the drilling efficiency of one of the old Chouinard forged hammers versus one of the newer cast ones to see if Deuce's theory is correct about forged vs cast hammer heads. 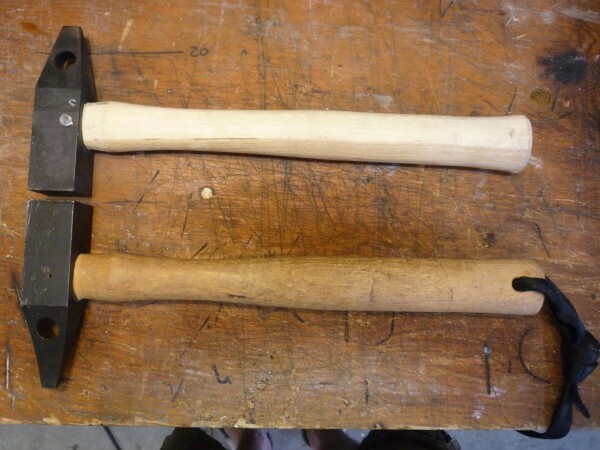 I'd like to try one of the old forged Chouinard hammers as well as a new BD one. I'd also like to try an A5/D5. It only takes 5 minutes to test a hammer - if I have the hammer. Maybe somebody would like to trade for a DAMMERR. I am in Mountain View, but can come down to Morgan Hill with my mid-70's Chouinard hammer for you to try out. I will send you a PM when I am available. Wow, impressive drive and determination. Thanks for sharing that! Awesome to see it unfold. You make it look so easy. My dad was an engineer, my big brother is an engineer, I'm an engineer, even my wife is an engineer but none of us have anything to do with Merrick Engineering. As professor Zsutty used to say "I are a engineer!" You must have a stack of slightly used SDS drill bits by now. I'll trade you one canned beer per bit. If you sharpen the carbide tip I'll upgrade you to bottled beer. You need to come over and try out the hammers so we can make one that is perfect for you. One of the best threads going on the taco stand. The metal head of power? We need more of this on the Taco and less of the polluting bollox that causes so much hurt. I wish I could do such stuff, but putting a picture up is my engineering limit!